When people talk of specialty coffee, they often mention Kopi Luwak as being the highest of the tiers, the rarest and most expensive coffee on the market. In case you haven’t heard of this ridiculous coffee trend, it’s basically coffee that’s been eaten and pooped out by a small animal. More specifically, the Asian Palm Civet, a small, cat-like creature native to Southeast Asia. 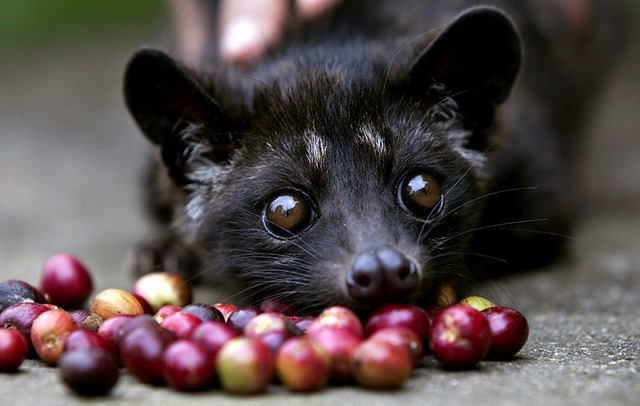 The Civet eats the coffee cherry, digests it and excretes the coffee, whereupon it is collected, roasted and sold for ridiculous amounts of money. That’s right, people actually PAY for poop coffee. And not only do they pay, but they pay a lot. And with the rise in this ridiculous trend came the cleverly marketed illusion of deliciously special coffee. Well, we are about to tell you why it’s anything but. Coffee that has been pooped out is not delicious. 2. Who would pay that much? Sure, if you’re a top of the market product then you can definitely get away with charging a premium price. On one website selling to Australia I found Kopi Luwak ranging in price from $149 – $288 per 100g. Per ONE HUNDRED GRAMS. That’s $1490 – $2800 a kilo. What the heck. You would have to be insane to spend that much on coffee, even specialty coffee. 3. Animal cruelty is a sad reality of the industry. While we would like to think of these fluffy creatures roaming free in the trees and eating as many coffee cherries as their little hearts desire, before settling down to sleep and popping out a pile of very expensive poop, that’s sadly not the case. The rise in popularity of Kopi Luwak has meant that most of the coffee is processed in places compared to battery chicken farms. This poor treatment of the animal has caused a high mortality rate and a rapidly increasing conservation risk. Yet another industry exploiting defenceless animals for financial gain. 4. Everything that glitters is not gold. What’s to stop any mildly savvy, very cheeky, entrepreneur from selling whatever coffee he can get his hands on as Kopi Luwak… After all, if the taste isn’t quite so incredible as they are making out to be, then who would really know the difference? An estimate states that only around 500 to 700kg of the genuine product is produced annually, with MUCH more being sold, which doesn’t quite add up. If you’re looking for some truly unique and delicious coffee with a story, just try our Colombian Wild Grown Specialty Coffee. It’s grown in the wild Colombian rainforest by the Indigenous Kogi people, who have been there for centuries, tastes amazing and has NOT been pooped out by a small animal. 18 comments on "4 Reasons Why Kopi Luwak Isn’t Worth Your Money"
I hear what you are saying but we aren’t mocking it, we are pointing out that it’s not worth the money due to the low quality of the drink. In the beginning, the Civet was allowed to freely choose which cherries it would digest but these days they are being forced-fed and so beyond the cruelty that is happening, the quality has dropped because we don’t understand why the Civet chooses certain cherries. Thanks for highlighting this product. I haven’t tasted this coffee so I can’t comment on flavour. Price? Well, create enough hype and you can sell anything. You just have to make it sound rare and special and you’ll always have people willing to pay for it. The mention of cruelty to the animals involved in this process would mean that I don’t care how good the resulting coffee tastes, there’s no way I’d ever want to try it. It reminds me of what ducks and geese have to go through for foie gras to be made. You’re absolutely right Ali! It’s a disgusting side effect of the demand and in the case of the Foie Gras, the flavours that people are demanding. No animal should have to suffer like that. Your arguments against the coffee are primarily subjective and personal opinions. The coffee is expensive but it is very labour intensive, more so than normal coffee, and the price is reflected in this. As a regular traveller to Indonesia, the coffee is expensive when compared to others, but nothing like the prices you mention. If those prices are correct it is the importers/exporters that are charging the excessive prices not the locals. The criticism that the coffee has been through the digestive system of an animal seems to forget we drink the juices from a lactating cow, commonly referred to as milk. No doubt there may be some who mistreat the animals, however, I have not seen it. The coffee does have a smooth flavour and is popular for that reason. If the coffee elite don’t like that then it could be argued who is the more correct. The millions who like the drink or the hundred judges who don’t. My personal opinion is that I like the drink, but I am just one of the millions whose opinion apparently doesn’t count. Thank you for highlighting the animal rights issues involved in the sale of Kopi Luwak. Much like Foie Gras, where there’s a profit people are willing to cut-corners and subject animals to horrendous conditions. There are still many places, however, where you can try and buy Kopi Luwak for normal coffee prices (-$2-3 per cup). If you go to the magical village of Senaru in Lombok (Indonesia, neighbouring island to Bali), you can visit the small (locally owned) coffee gardens in the jungle. There you can see the locals gathering Kopi Luwak from the jungle floor and using it for themselves. They also harvest fresh vanilla, amongst other things. Although they don’t advertise it as a coffee tour, I visited this amazing place with Rinjani Dawn Adventures (www.rinjanidawnadventures.com) last year and loved it. Would you object if you knew the animals were free range? Of course you would. Luwak is the king of the coffee and has been for decades. I had this Kopi Luak Coffee 2days ago in Ubud (Bali) next to the Monkey Forest and taste like the normal Balinese coffee. I paid about 3 GBP for it for a tiny bit of coffee. That coffee is definitely over priced and over rated too. Not worth it. I found this article searching for ways to process the small amount of coffee that I am about the get from an arabica tree I planted a in a large pot couple of years ago. I want to remove the pulp leaving the kernel to be dried and become parchment coffee. Now if I had a civet I could feed the ripe beans to it, collect the poo, wash and dry it and then roast it. Lacking a civet (not common in Oz and the RSPCA would probably object if I found one) I could ferment the beans with water, bakers yeast (for Saccharomyces cerevisiae) and kimchi (for Lactobacillus brevis). Has anyone tried this? In a perfect world there would be a culture available that would mimic the inside a a civet but I cannot seem to find anything. Why does the coffee keep changing from region to region? The new Colombian Popayan Coffee Beans!